I’m a MASSIVE sucker for chicken and sweetcorn soup. When it’s on the menu at a chinese restaurant I find it so hard not to order… and I usually end up full before the main course! Bring the stock to the boil in a large saucepan(depending on your taste or needs you may wish to substitute some of the stock for water). I misread 6 cups and added 8 cups, not that it mattered because I used so much stock powder. Add chicken breast fillet to the stock, turn the heat off and cover the pain with a lid for 15 minutes. I think next time I’ll keep it in for twenty as it was still a bit raw in the middle and therefore nearly impossible to shred. Remove chicken breast from the stock and leave to cool for a few minutes then shred. I did the shredding with two forks… not sure if there’s a better way but I’m sure I looked bizarre doing it. Add corn to stock and bring to the boil over a medium heat. 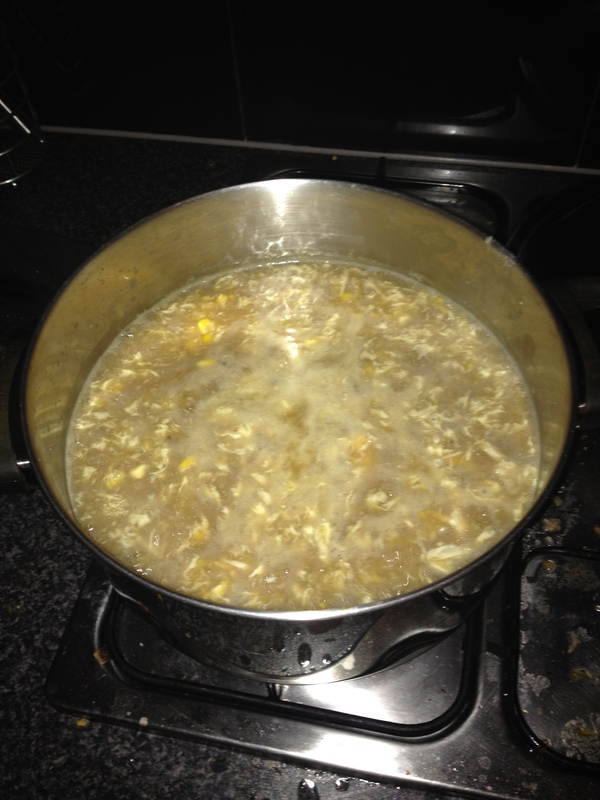 Combine soy sauce and cornflour into a paste then stir into the soup to thicken slightly. Went overboard on the soy sauce I think, so it was both quite salty and quite dark in colour. Because I used so much stock, I had to add extra cornflour as it didn’t thicken as much as I would have liked. Add shredded chicken to soup. Success! This bit went fine! Slowly pour beaten eggs into the soup in a steady stream, stirring constantly with a fork. I’m a freaking genius for getting this right (with hubby’s help). Very impressed with myself and will not enter into any discussion re: not being an amazing master chef. Serve topped with the sliced spring onions and enjoy! Umm… forgot this at the store. Oops! funny how my food pictures never look as appetising as proper food websites?? ?